Click the object on your slide with the animation effects that you want to reorder. 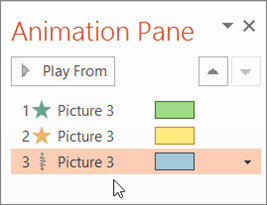 On the Animations tab, click Animation Pane. 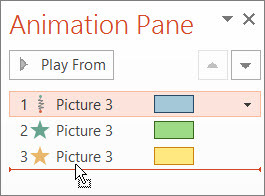 In the Animation Pane, click and hold the animation effect you want to move, and drag it up or down to a new position. In the picture below, we’re moving the 1st animation effect down below the 3rd one. Tip: A horizontal indicator line appears when you reach the new position. Release the mouse button to finalize the move. The picture below shows the 1st animation effect is now in position 3. On the Animations tab, click Move Earlier or Move Later to change the playing order. The animation numeral next to the object on the slide changes to indicate its new position in the playing sequence.